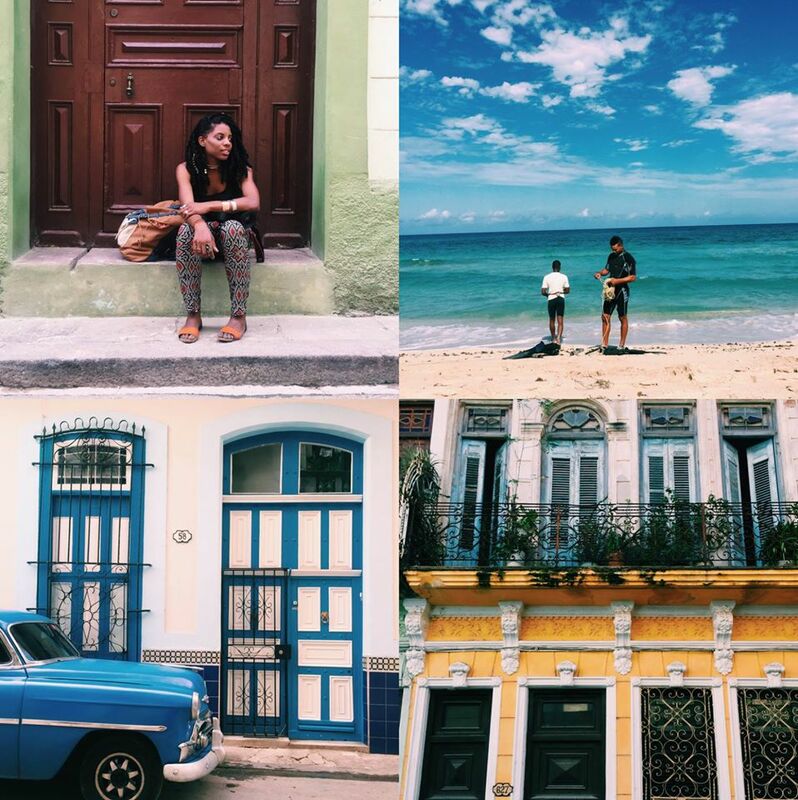 A documentary filmmaker and photographer working in Havana, Cuba, Amberly Alene captures the colorful vibrancy and culture of the Caribbean through a photographic eye. She recently took over the Alaska Airlines Instagram account as a “Local Wanderer” as a part of Alaska’s Weekend Wanderer series. To see more local flavors of the world, make sure you’re following Alaska Airlines on Instagram. The streets of Havana have their own unique melody. The rumbling of taxi engines and the calls of street vendors collide with the sounds of pop music and bachata from the speakers of bici-taxi drivers. The boom of a reggeton beat may greet your ear at the passing of an arch of any given doorway in a centuries old apartment building in Havana Vieja. For me, each day in Havana is a ballad. It is an intricate song with a special melody. There is a constant rhythm of day to day life that makes the city so famously unforgettable. Jazz lovers will appreciate this famous venue in Vedado, situated between Avenue 23 and O Street. The easy-to-find entrance to the club is marked by a classic red English telephone booth. La Zorra y el Cuervo or “The Fox and The Crow” showcases some of the best in jazz music and includes the acts of many young up-and-coming Cuban artists. Talented jazz singers such as Havana’s own Zule Guerra and her band can be heard live, as there is music every night. There is a $10 charge for entry that includes two drinks, and although the club is a small setting, it hosts an intimate and relaxed atmosphere that is a must-see for the jazz enthusiast. This colorful alley located between Aramburu y Hospital Street in Centro Havana is lined with the beautiful artwork of Salvador Gonzales. The murals, paintings and sculptures are dedicated to the Afro Cuban culture and religion, and is a great visit for artists interested in the influence of African culture in Cuba. At noon on Sundays, there is a rumba party, with live music and folkloric dance performances. Callejon de Hamel makes one of my favorite picks, as it is not only a great opportunity to listen to great music, but also to learn about some of the oldest roots of Cuban culture. Hip hop lovers, Thursday is your night. Old school hip hop, Classic R&B, Funk, break dancers and even some dance battles can be found at Palacio de la Rumba’s hip hop party on Thursdays. For adventurers looking for an alternative nightlife scene, Palacio de la Rumba, located in front of Parque de Trillo in Centro Havana and is my pick for a night of great music and people that go against the grain. Hip hop emerged in Cuba in the 1990s, and since then, Cuban hip hop artists and DJs have received international recognition for their unique style and socially conscious themes. Hip hop groups such as Obsesión and Doble Filo pioneered the movement with their innovative sound. Palacio de la Rumba on Thursday night is the perfect place to get a feel of the scene and the underground hip hop culture that still remains strong in Havana. Find your way to Palacio de La Rumba on a Thursday night if you are looking for something a little different from traditional Cuban music genres. Tucked away at one of Havana’s less tourist- explored neighborhoods, Miramar, is Diablo Tun Tun. This venue has cheap drinks and brings a mixed audience of locals and foreigners, which is why it’s always packed and hot — perfect for a night out dancing. While Diablo Tun Tun exemplifies the Cuban tradition of sets that last the whole night, most celebrated is its matinee show that starts at 5 p.m. and ends at 9 p.m. On Thursdays, this show is reserved for Ray Fernandéz, whose Peña is considered one of the best in the city. Along with an outfit of horns, piano and percussion, this show is perfect as a pre night energizer or dance fix. The beautiful waterfront location makes 1830 restaurant located on the Malecon of Havana one of the most breathtaking places to listen to live music in Havana. The colonial era building was once the mansion of Cuban president Carlos Manuel de Cespedes. The meals at the restaurant are moderately priced, but the best part of 1830 isn’t the food. Locals and tourists enjoy live salsa music at 1830 on Thursday and Sundays nights with a great view of the sea and a nice breeze. After a hot summer day, 1830 is my pick to cool off and enjoy great music and the sounds of a live salsa band. 3 comments on "Eclectic live music in Havana, Cuba"
I knew this would be the case that all the best authentic music clubs would be late night. We’re going to be in Havana for just a day… Is there any lunch spot with live music? Let me ask the writer of this story and get back to you! 1. La Vitrola- I love this place! It’s an amazing little 1950s inspired restaurant with tasty drinks, great food and of course, live music. Located on San Ignacio at the corner of Muralla, you can find La Vitrola in plaza de las palomas (plaza of the pidgins). Plaza de las palomas is a beautiful colonial plaza. You should make sure to bring your camera for pictures! 2. Mojito Mojito – Of course the mojitos here are really good and if you like seafood, I would give this spot a try because they have a variety of great options. The restaurant is located at #166 Muralla between Cuba and San Ignacio. 3. Los Dos Hermanos- I will give you my honest opinion about this place: If you are looking for live music and a drink, then I would stop by because there is almost always music playing in the daytime. I wouldn’t say that the food here is particularly stand out, but this bar/restaurant is located near the ferry that I take to get to my house. I walk by almost every day, and usually by lunch time there is a band playing. Los Dos Herman’s is located at 304 Avenida del Puerto. 4. Here’s a suggestion if #1 and #2 don’t work out for you. I would recommend giving my favorite place to have lunch on Havana a try. It’s called Màs Havana, located on Calle Havana 308 between San Juan de Dios and O’Reilly. After eating lunch there, maybe swing by Los Dos Hermanos for some music and a drink. Other honorable mentions for drinks and live music in the daytime would be La Bodeguita Del Medio, Bar La Dichosa and Bar Monserrate. All of these places serve food, but I think that La Vitrola and Mojito Mojito have both great food and great music and are better places to have lunch with the music experience that you are looking for. It is a little easier to find live music at night, but with some of the names on this list, you should be able to discover something great!